I’m not a big fan of cooked breakfasts. I enjoy them as a late breakfast/brunch, but on an average day I prefer something lighter. Granola and full-fat Greek yoghurt has been one of my staple breakfasts for quite some time – I think since after our holiday to Corfu a couple of years ago. But the problem with shop bought granola is that it is often packed full with sugar. We have a rule in our house regarding breakfast cereals. I don’t ever buy any that are ‘unhealthy’ or ‘sugary’…basically the ones that are marketed to death to children. Little I didn’t even know that Coco Pops existed till a few months ago. The reason being, it’s a slippery slope once you’re on it. I know that from recent experience, since as a treat I bought chocolate Pop Tarts for our recent caravan break in Devon, and Little I has not stopped asking for them since. 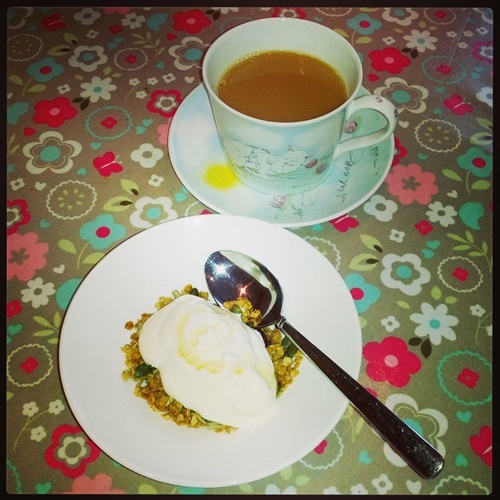 So recently we had a go at making our own granola and it was such a success that I thought I’d share the recipe with you. It makes a great start for the day, and easily fills me up till midday. What’s more it’s quite good fun to make with the kids, even though it involves a small amount of cooking. 200g dried fruits and nuts (we used raisins, dates, cranberries and almonds). Next time I’m going to add some cacao nibs too. 2. In a saucepan, melt the honey and coconut oil over a low heat. 3. Remove from the heat and stir in the porridge oats until they are well coated with the mixture. 4. Pour the mixture onto a large baking tray and spread evenly. 5. Place the baking tray into the preheated oven and bake for 25-30 minutes or until toasted and golden. 6. In the meantime, place the pumpkin seeds and sunflower seeds in another baking tray and place in the oven to toast for about 20-25 minutes or until nice and golden. 7. Once the oats and seeds are toasted and golden, remove from the oven and leave to cool. To serve it’s lovely with a dollop of full fat Greek yoghurt, some homemade berry compote if you have the time to make it, and a dash of runny honey. The first morning we tried our homemade granola, Little I gobbled hers up and immediately asked for seconds. Within the same breath she added, “maybe we should try making our own Pop Tarts too!” Hmmmm. If you give the recipe a go, let me know what you think, and what dried fruits, nuts and seeds you decide to use. * Recipe adapted from Linda Barker’s Mums on the Run granola recipe.